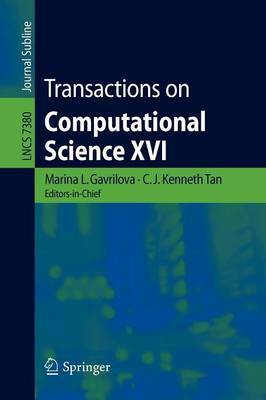 The LNCS journal Transactions on Computational Science reflects recent developments in the field of Computational Science, conceiving the field not as a mere ancillary science but rather as an innovative approach supporting many other scientific disciplines. The journal focuses on original high-quality research in the realm of computational science in parallel and distributed environments, encompassing the facilitating theoretical foundations and the applications of large-scale computations and massive data processing. It addresses researchers and practitioners in areas ranging from aerospace to biochemistry, from electronics to geosciences, from mathematics to software architecture, presenting verifiable computational methods, findings, and solutions and enabling industrial users to apply techniques of leading-edge, large-scale, high performance computational methods. The 16th issue of the Transactions on Computational Science journal contains 11 extended versions of selected papers from Cyberworlds 2011, held in Banff, AB, Canada, in October 2011. The topics span the areas of haptic modeling, shared virtual worlds, virtual reality, human-computer interfaces, e-learning in virtual collaborative spaces, multi-user web games, cybersecurity, social networking, and art and heritage in cyberspaces.